Two stories in one! Eli brings the Destiny crew together to play cards and tell their stories, while Teyla Emmagan fights to survive inside a Wraith hive. 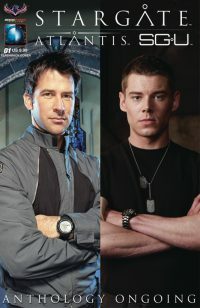 Stargate fans rejoice! Thanks to the incredible reaction to our SGA / SGU Anthology Annual issue, we are launching a brand new ongoing series featuring the very best of both series! In “Eli’s Game” after the events of SGU #6, Eli has scavenged and improvised several decks of playing cards from the crew. Now he’s assembled a “high stakes” game among Destiny‘s regulars, but the real action isn’t in the cards but the player’s memories. And “Wraith Sense” Teyla must rely upon her innate abilities to survive in a nightmarish Wraith hive. Stargate Atlantis / Universe Anthology comes with three covers: SGU Photo Cover, SGA Photo Cover, and a special Premium Limited Edition Flashback Photo Cover.